OutSports comes up with this bit of news this morning: Tyson Gay, who ran the fastest recorded time in history in the 100 meters on Sunday, was referred to as Tyson Homosexual in several headlines on the site OneNewsNow; which is run by the extreme right-wing American Family Association in Tupelo, Miss. 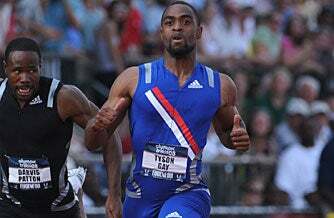 Apparently, they have set a filter to change many instances of “gay” to “homosexual,” which is how Tyson Gay, who set a record in the 100-meter dash this weekend, changed his name. This occurs on searches and on their home page, but the actual AP story linked from the site does use “Tyson Gay.” Headline writers everywhere are delighted the name change is only virtual. A quick check of their site seems to indicate that they've fixed the problem; at least on the site itself. Although I'll bet there was much debate over at the OneNewsNow offices.